Yesterday, I was reminded of the alcoholic insanity that is always lurking in the back of my mind. When I first got sober, I remember my sponsor telling me that you are never safe from that first drink. At the time, I didn’t think much of it, in fact, I probably half-listened as I did to many of the things she told me. I didn’t “get” it yet and all I cared about was rebuilding my life, which meant not drinking anymore. I first got sober in February 2012 and relapsed the following July – last summer. 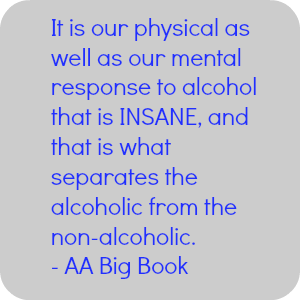 It took my relapse for me to truly understand I was powerless over alcohol and I was never safe from that first drink. Fast forward to yesterday. I’ve been sober for nine months and have been fortunate to have had very few cravings for alcohol. Yet, while I was driving my kids to gymnastics late yesterday afternoon, I had an overwhelming craving for a drink. It hit me like a ton of bricks. The sun was out, the weather was warm and I wanted (or needed) that drink. Remember, I relapsed last July, so obviously these summer-like days are a trigger for me. There was no reason for my craving. I was in a great mood, but somewhere my mind was telling me I would even be better with a drink. Crazy? Yes. This is the INSANITY of alcoholism. My body was literally craving that drink. I could almost taste that chilled glass of wine. But, why? After EVERYTHING I’ve been through and put my family through, how could I even consider a drink? Unless you’ve been there, it’s impossible to understand the insanity of addiction. It takes over your body and mind, until it’s the ONLY thing you can think about. It’s awful, it’s horrible – it’s my alcoholic mind. When I got home, I was irritable and angry. I told my husband I was just hungry and tired. It wasn’t until we sat down for dinner that I told him the truth. I had been craving a drink. While he knows that this is a reality of my disease, I still see the pain my honesty causes him. For those who love us, one of their worse fears is that we will take that first drink. Tonight, I was tired. I didn’t feel like going to a meeting, but I knew I needed one. And, my husband knew I needed one. I went to one of my favorite women’s meetings and I left feeling renewed and grateful for the honesty that takes place in those rooms. I know that I will never be safe from that first drink, which is why I have to continue to do the work and stay honest with myself and others. For me, it’s that simple. The first summer was tough for me because I loved to sit outside and drink beer on the porch with my husband…although I would always sneak into the house to chug a beer to get a better buzz. I was too squirmy to sit outside…it gets better, though! I’ve learned to treat myself in other ways, and I love summer evenings, again, though now I’m happy to wake up the next morning without the shame and remorse I felt after a night of drinking. Thanks, Karen! Oh man, I remember always trying to “sneak” a little more to get that buzz I was longing for. Of course, I don’t really think we were as clever as we thought we were. I’m sure my husband was well aware of my efforts! This will be my second summer sober and I’m really looking forward to it, especially the no hangover part! Thanks again for your comment! I have so many other great one’s I’d like to share but it’s late & I need to get to bed. Here is a great website that can help you w/ your struggles – just came across it tonight – God sent for it was before I came across your blog post! Thank you Brandye! I love those affirmations! Think I will write some down to carry with me. That’s wonderful about your sister’s sobriety – good for her! Thanks again for your support! It’s odd but happiness has always been a trigger for me so I get what you’re talking about. My biggest cravings have always hit me out of the blue like that. Good job doing what you needed to do to take care of yourself! Thanks, Karen! I agree, I loved drinking when I was happy. Really, I didn’t need any excuse. Strange how it just hits us sometimes. Good reminder how serious this stuff is. Grateful for your support! You’re so right! It’s always there, waiting for us. Just when I start getting complacent in my recovery, something like this will happen and give me a good wake up call. Thanks for your comment! Those sunny days totally get me too… I have to make sure I have the day completely planned out in advance where there is no ‘sitting around’ time to tempt me ! Good for you for acknowledging the craving – but not giving in !!! You are so strong! Proud of you my friend! Chenoa, thanks for this honest, important reminder. I rarely have that mental obsession return, but when it does, it feels like it’s physical–and even though it technically takes alcohol to trigger what they call the phenomenon of craving, I think there’s this bone memory that comes right back to us and it feels exactly like we had drink an hour ago and we’re dying for another. I love that you were honest with your husband. I’ve had to say those same words before. Your post reminded me that every day I don’t have that desperate thirst nipping at the edge of my consciousness is pure gift. Just love you and your blog! Thanks for your support, Heather! I love that term “bone memory.” It’s so true. Sometimes the craving is so real, but, like you, I’m grateful they are few and far between. Btw, just started your book today! Looking forward to reading your story. Ironically, we’re in Sisters this weekend for the rodeo – guessing it’s close to where you used to live! Small world! Chenoa, congratulations on surviving the urge/obsession to drink with your 9 months intact… so few of us alcoholics can manage it! About 2 months ago, I had a very similar situation, followed by the honest conversation with my husband, followed by the pain I caused him rushing back between us. The physical urge went away pretty quickly (relatively speaking), but the aftershocks took me a few days to over come. I felt guilt, shame, remorse, over simply having the thought. It took some wonderfully caring people in the rooms of AA to knock some sense into me… “oh, gee, you wanted to drink? of course you did, you’re an alcoholic!” It was their understanding that got me through it, and it sounds like you have that too. I appreciate your honesty in this post, it is so vitally important to keep this at the front of our minds… we are powerless, but we can’t get drunk, we can’t wake up the beast, if we don’t take the first drink! Your highlighted quote at the top of the page “Insanity” about being insane, you say it’s from The Big Book. Which page is that quote on exactly? “The insidious insanity that precedes the first drink.” It’s back to the second part of Step 1. My life is unmanageable regardless of whether I’m drinking or not. To truly get well, I had to admit that my life was unmanageable by me, hence the willingness to believe in something more powerful than me. This was the beginning.